The NASCAR Elimination race at Kansas Speedway was uneventful as far as accidents go. The action came as drivers fought to advance in the Playoffs with Chase Elliott winning his second race in the Round of Twelve. The Hollywood Casino 400 had only three caution flags issued. One was issued when William Byron’s #24 Chevrolet blew its engine and put fluid down on the track on lap 58. The other two caution flags waived at then end of stage one which was won by Joey Logano and stage two which was won by Kevin Harvick. It looked as though the win would be a battle between Joey Logano who led a race high 100 of the 267 laps in the race and Kevin Harvick who led 76 laps. However, as the race wore on Joey’s car began fading back in the racing order. Kevin looked to be in position to score the win. That was until he was caught speeding on pit road. The penalty incurred for that mistake would take the chance to win away from him. The penalty for Kevin opened the door for other drivers to take advantage of. Chase Elliott and Kyle Busch were the two drivers poised to capitalize on Kevin’s mistake. Chase got out to the lead and held of Kyle through the final laps to claim his second win in the Round of Twelve in NASCAR’s post-season. The win was Chase’s first at Kansas Speedway and his third career win in NASCAR’s top division, all of which came this season. Kyle Busch did end the race in the runner-up position with Kyle Larson claiming a third place finish. Erik Jones claimed fourth place and Martin Truex Jr. rounded out the top five. See the complete race results in the Hollywood Casino 400 here. Following the race Sunday afternoon (10/21/18) at Kansas Speedway Ryan Blaney, Brad Keselowski, Kyle Larson and Alex Bowman were eliminated from championship contention as the 12-driver field was cut down to eight. The points for the remaining drivers were re-set and their Playoff Points applied to set the ranking for the Round of Eight. 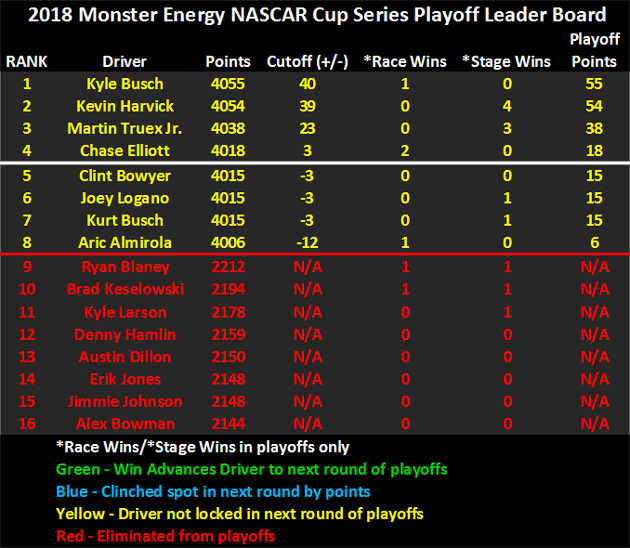 See the 2018 NASCAR Playoff Leader Board for the next round in the playoffs below. The eight drivers still racing for a spot in the one-race-winner-take-all Championship Round at Homestead-Miami Speedway November 18th will have to earn one of the four spots available in that race. Their first of three chances to do that comes this weekend in the First Data 500 when the Monster Energy NASCAR Cup Series goes “Short Trackin'” at Martinsville Speedway Sunday afternoon, October 28th.